This section describes email security settings in MS Office Outlook 2007 that control adding encryption and digital signature to outgoing email messages. 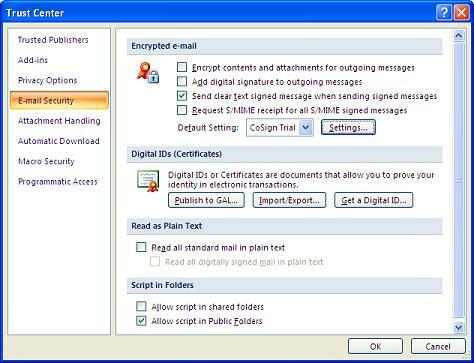 To understand how to use digital signature and encryption in Outlook 2007, I reviewed the E-mail Security settings. 1. Run Outlook 2007 and click "Tools > Trust Center". The "Trust Center" dialog box shows up. your identity in electronic transactions.